Rieger & Moser GmbH & Co. KG from Ulm marked the end of a Sikorsky CH-53's life of service with a special deployment, Sept. 26. 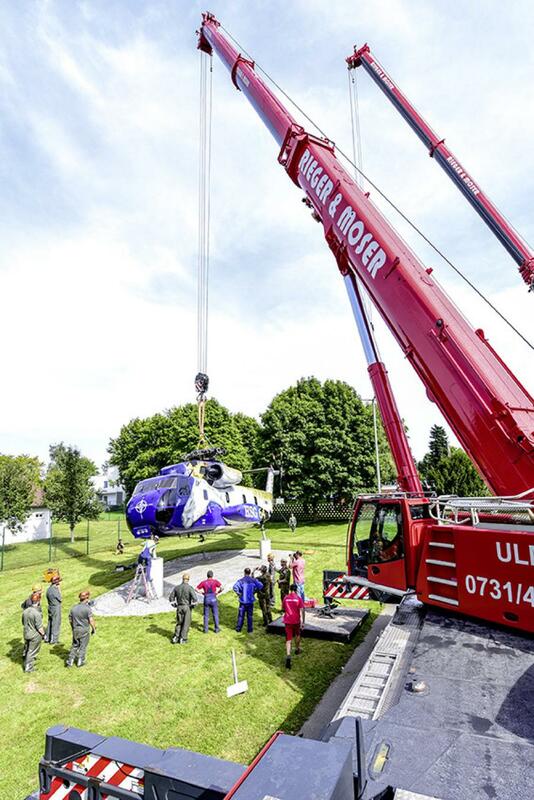 A Liebherr LTM 1350-6.1 mobile crane lifted the restored helicopter onto pre-prepared concrete supports. This exhibition piece will in future welcome visitors to the Kurt Georg Kiesinger Barracks in Laupheim, Germany. To set the helicopter on the three pre-prepared foundation points, Rieger und Moser deployed its Liebherr LTM 1350-6.1 mobile crane. 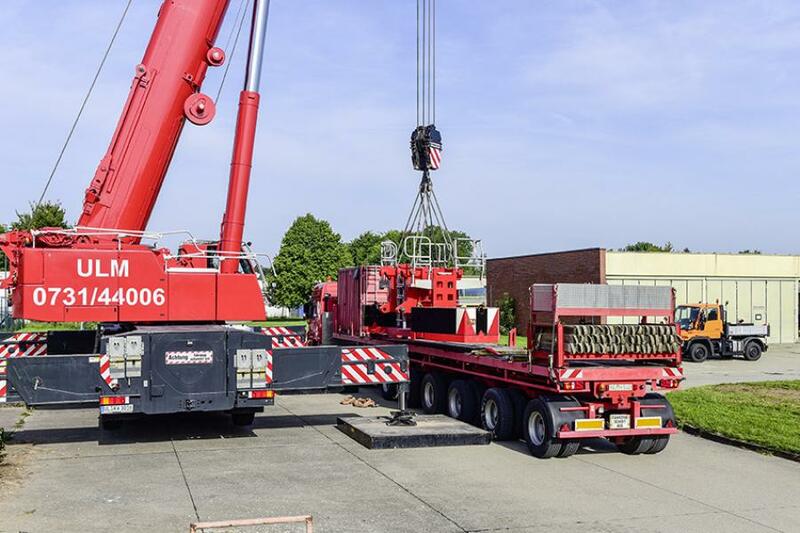 The company purchased the crane directly from the crane manufacturer as a pre-owned model one year ago. 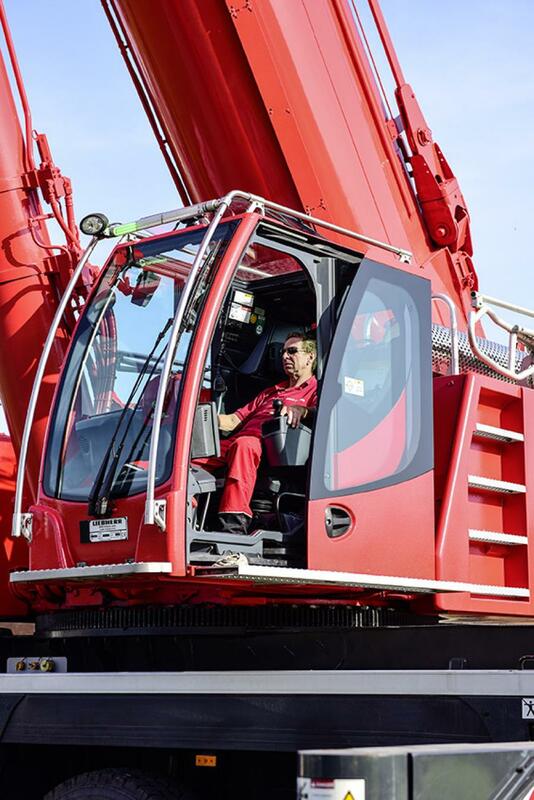 "The crane is in an excellent condition, and it's a pleasure to drive,” said Crane Driver Michael Rost. “I'm very happy." 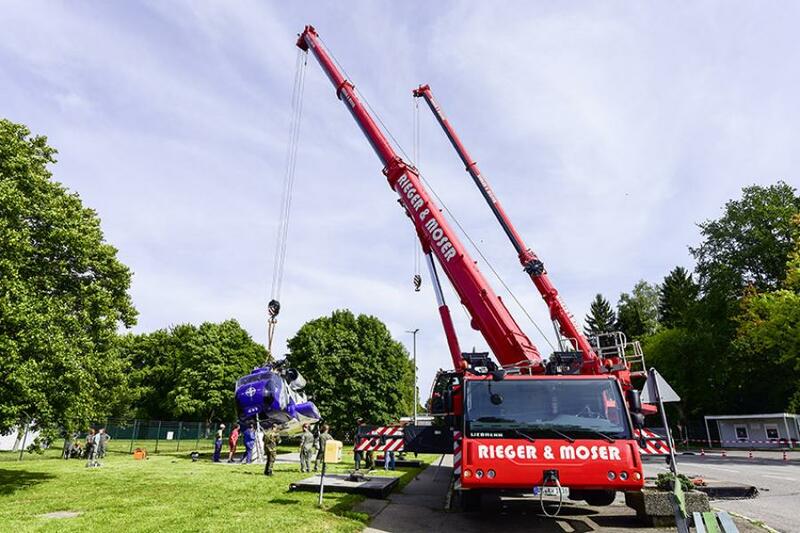 With a counter-weight of 40 tonnes, the LTM 1350-6.1 from Rieger & Moser lifted the nine-tonne helicopter by its main rotor using a special lifting beam. The CH-53 took around ten minutes to make its final "flight" to its location in front of the barracks. Using guy ropes on two sides, soldiers secured the museum piece and guided it into the required position. 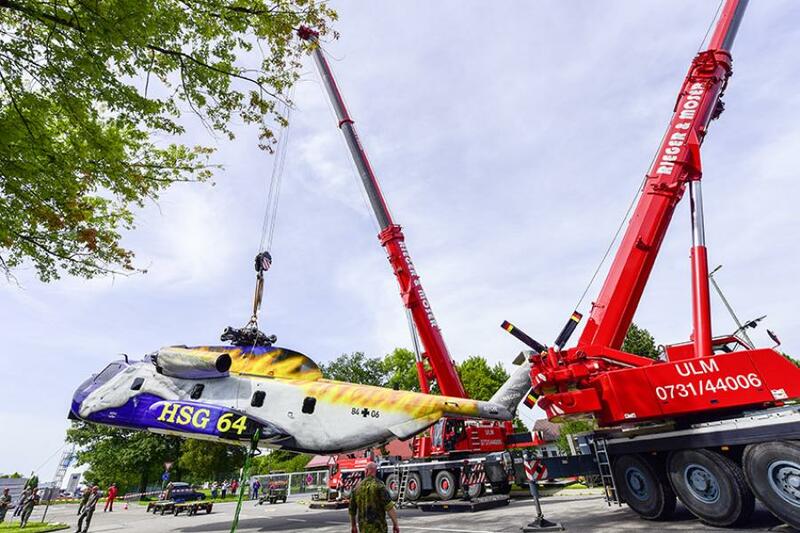 The subsequent maneuvering onto the concrete supports was a lengthy process because the helicopter had to be moved into a position similar to the one it would adopt in flight. This is where an LTM 1095-5.1 from Rieger and Moser came in. Minor corrections had to be made to the supports before Rost was able to position his unusual load with millimeter precision. The decommissioned CH-53 is an exhibit from the military history collection. 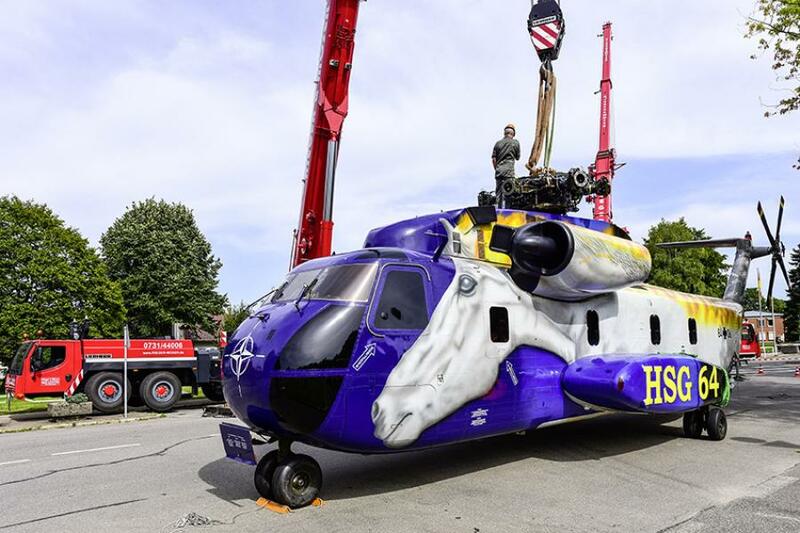 "The helicopter's special paintwork has a specific background,” said Lieutenant Colonel Manderscheid. "The helicopter was produced in Germany. The grey paint on 2 / 3 the tail and the Pegasus painted on the side denotes its previous ownership by the army. The various deployments that the helicopter was involved in are also marked on it. Since January 2013, the helicopter has been owned by Helicopter Squadron 64 of the German Air Force, as symbolized by the blue coloring on the nose." The CH-53 was brought into the service of the German Army in May 1972. By the time of its final flight on the 14th of April 2016, it had spent a total of 6,370 hours in the air.